Chain 2 (does not count as a stitch), work the first dc in the first st.
Chain 3 (counts as first dc), work the first dc in the next st. While these methods are great when we’re first learning, eventually we begin to notice that both of them cause gaps in our work. This is when the alternate double crochet stitch (also referred to as a chainless double crochet stitch) becomes a great new tool to learn! I also use this when working in joined rounds. It eliminates the gap you get when you have a ch 2, double crochet in the first stitch. 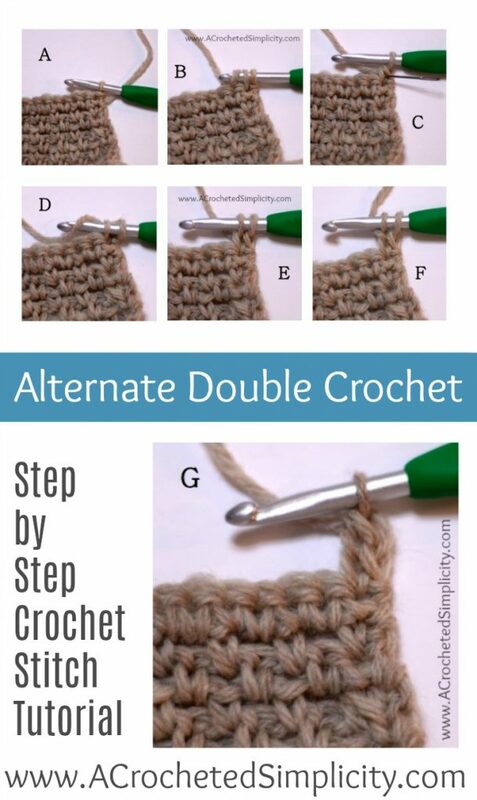 While there are many tutorials out there for an alternate double crochet, I wanted to share with you my favorite. 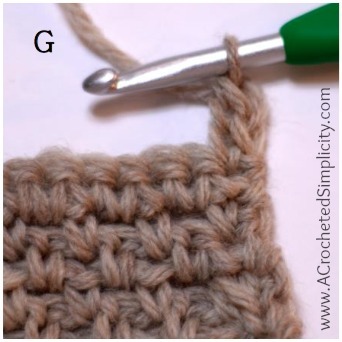 This is my go-to alternate double crochet stitch and I use it every time I need to begin a row with a double crochet. I LOVE how something SO simple can make such a huge difference in my work! Try out the Alt-dc on a couple of my free crochet patterns: Snowflake Keyhole Scarf & My Favorite Summer Top. Do you need to work an alternate treble crochet stitch? Click HERE for my Alternate Treble Crochet Stitch Tutorial! Let’s work an Alternate Double Crochet! Photo A: Turn your work to begin a new row, but DO NOT chain. Photo B: Work a single crochet stitch (without a turning chain), insert your hook into the first stitch, yo, pull up a loop, yo, pull thru both loops (see next pic). Photo C: See the yarn needle? It’s between the two legs of the single crochet stitch you just made. This is where you insert your hook in the next part. Photo D: Insert your hook between the legs of the single crochet stitch. Photo E: Yo, pull up a loop. Photo F: Yo, pull through one loop. Photo G: Yo, pull thru remaining loops to complete the stitch. Voila, you’ve just worked your first alternate double crochet stitch! Thank you very much for the tutorial on the alternate double crochet. Like you, I noticed gaps but had no idea how to eliminate those gaps, but, now I do! So it’s basically a waistcoat DC? BRILLIANT! I’m totally doing it this way in all my projects from now on!